Factory Production Flow: Multiple Hydraulic cold presses provide a manufacturing capacity of up to 700 2-sides decorative laid-up panels in a single eight hour shift. 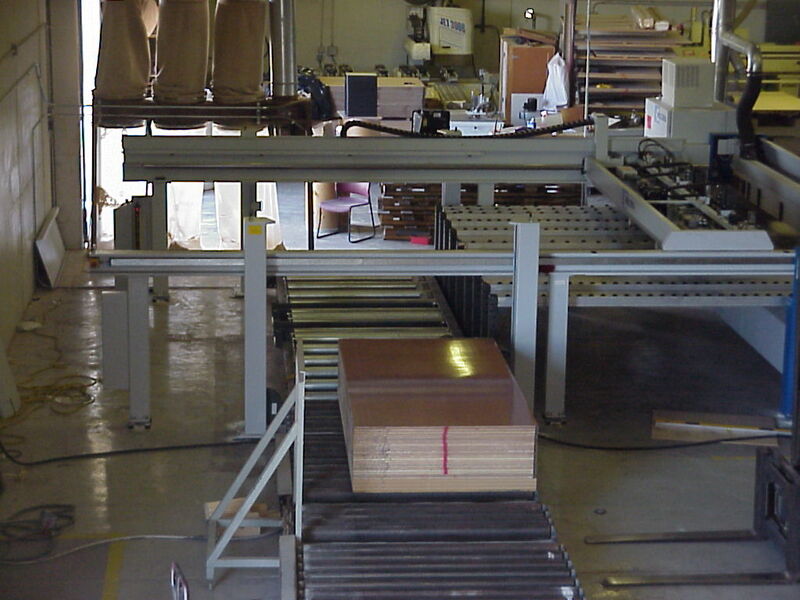 The Hi Production CNC panel saw trims or cuts to size, as required, up to 14 feet in length. 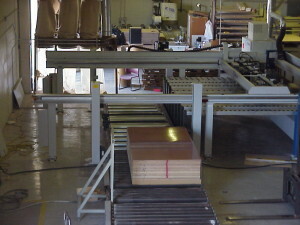 For more complex configurations the material is run through a CNC router or CNC machining center. Decorative edge treatment is accomplished on a Holz-her 1447 Accord edgebander where a straight edge is covered with PVC, wood trim, veneer or HPL strip (self-edge). Finally, the parts are palletized and packaged according to our customers preferred shipping method. Warehousing: Finished Goods storage and inventory management services are available as needed. Chemclad sets up raw material stocking programs to meet each of our customer’s needs. FSC® Certification – Chemclad is FSC certified (#FSC-C006039). Ask us about the availability of FSC certified product. Contour edgebanding: For radius corner, round tops and other similar non-straight line edgebanding requirements. 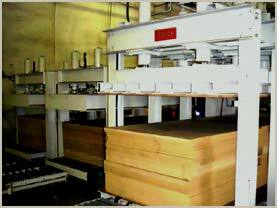 Additional capabilities include machining/boring of components as requested by the customer. Pre-Production Engineering: Specialized engineering is available utilizing AutoCAD drawings for more complex jobs. Labeling of components including bar coding is available upon request. Additional front-end engineering includes Prototype components when required. Before parts are cut, material is optimized for best yield based on the number of components requested. For example, if 500 components of a set length and width are needed, the engineer will optimize the request and may find that there is a better yield from a 5′ x 12′ panel as opposed to a 4′ x 8′ panel. The result is a cost saving for our customers. Warranty and Limitations of Warranty: Chemclad warrants its products free of actual defects in material and workmanship, provided that the buyer notifies Chemclad in writing, expressly describing the alleged defects, within one hundred eighty (180) days of shipment to the buyer from the factory. This warranty is limited to replacing or repairing the product at Chemclad’s option, F.O.B. Chemclad’s factory, if any part of which, upon Chemclad’s inspection, is found to have a defect in material or workmanship. In no event shall Chemclad be liable for incidental or consequential damages arising out of the use of Chemclad’s products, and Chemclad’s liability shall not, under any circumstances, exceed the purchase price of the product involved. This express warranty does not cover any of Chemclad’s products which the buyer modifies, refits, rebuilds, cuts, or otherwise alters from its original condition as manufactured by Chemclad. APART FROM THE ABOVE EXPRESS WARRANTY, THERE ARE NO WARRANTIES, EXPRESS, IMPLIED OR STATUTORY, INCLUDING WITHOUT LIMITATION, WARRANTIES OF MERCHANTABILITY AND FITNESS FOR A PARTICULAR PURPOSE, WHICH EXTEND BEYOND THE DESCRIPTION ON THE FACE HEREOF.